Description: Adding a little bit a brake smoke into the air. Description: Sorry I was talking to a friend and didn't want to take the effort to run across the tracks to catch the sunny side. Description: BNSF Mixed Freight Train headed under 119th Street next to I-35. Title: BNSF 7278 fly's around the curve as the engineer starts to apply the brakes and using Dynamic Braking to slow this Baby down for the crew swap at BNSF Barstow, Ca on this Very Hot Desert Sunset Evening Photo. Title: BNSF 7278 gets closer to me as she slows down on this Very Pretty and Very Hot Evening sunset shot as she rolls eastbound with a Z. Title: BNSF 7278 rolls into the BNSF Barstow Depot pulling a Z-Train at Sunset on this Very Hot Evening. Title: BNSF 7278 Newer Dc gevo at the time. 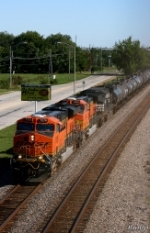 Title: BNSF 7278 teams with 4912 to hurry more stacks east. Title: BNSF 6665 with BNSF 7278 head westbound with a Z Train towards the LA Basin. Title: BNSF 4571 And others Sit in the yard. Description: waiting for work in the trra madison yard. Description: WB stacks descend through Kingman Canyon.